I’m not sure how overnight oats passed me by for so long, but once I just finally tried overnight oats, I was in love. I love that I can mix a few simple ingredients together at night and that it’ll be ready for me the next nothing. 10 minutes, then sleep. Perfection. Because what’s better than a delicious, clean-eating, healthy, and easy breakfast waiting for you when you wake up? I mean…”sleep” is pretty much an ingredient here. I also love that my kiddos love overnight oats, too. They enjoy choosing what flavors they want in their mason jars and it’s something they look forward to the next morning. 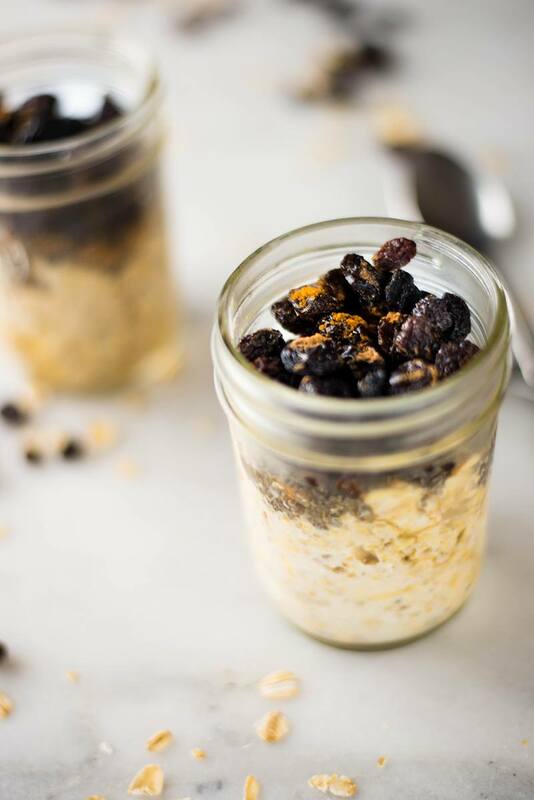 This overnight oats recipe is super tasty. It is jammed full of fiber and protein and yumminess. Honestly, though, it is hard to go wrong with cinnamon, oatmeal, raisins, and yogurt. I also add in chia seeds for additional protein and texture. So good, yet so simple! 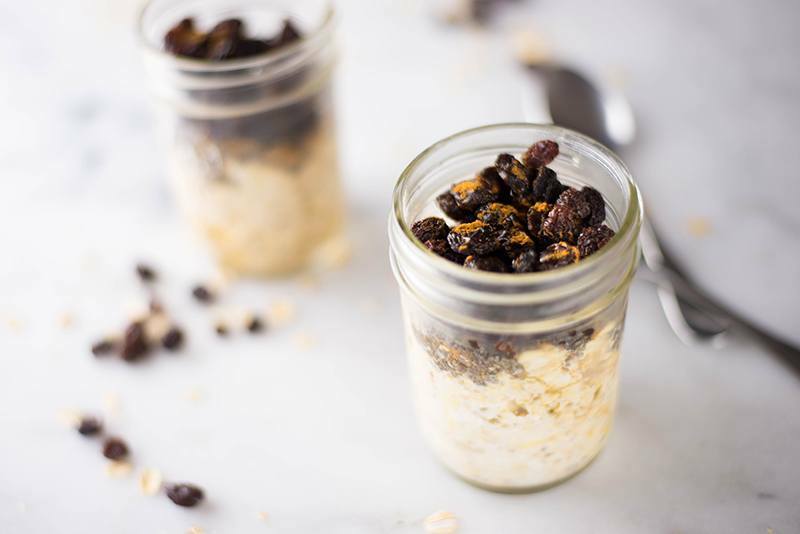 This Cinnamon Raisin Overnight Oats recipe is just one of 20 tasty, quick, and healthy breakfast we’re enjoying during our 21-Day Clean Eating Breakfast Challenge. If you’d like to sign up, all you have to do is click right here. It’s totally free and it’s lots of fun. 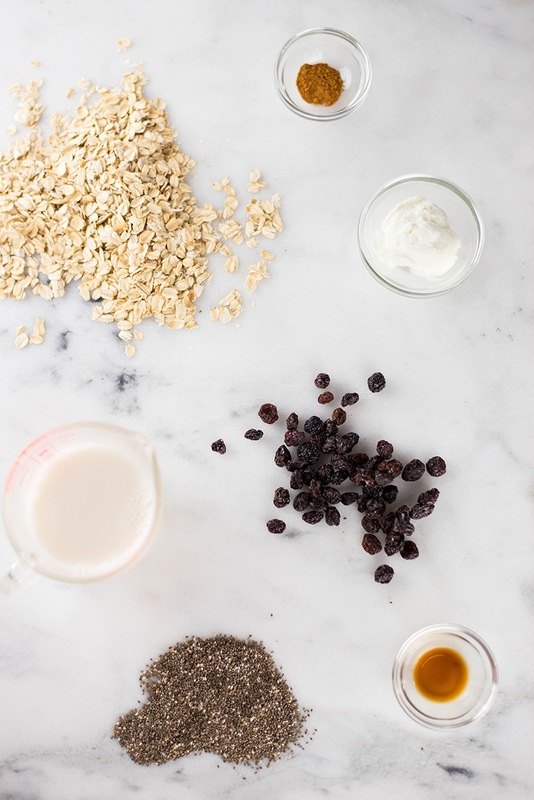 Plus: overnight oats! 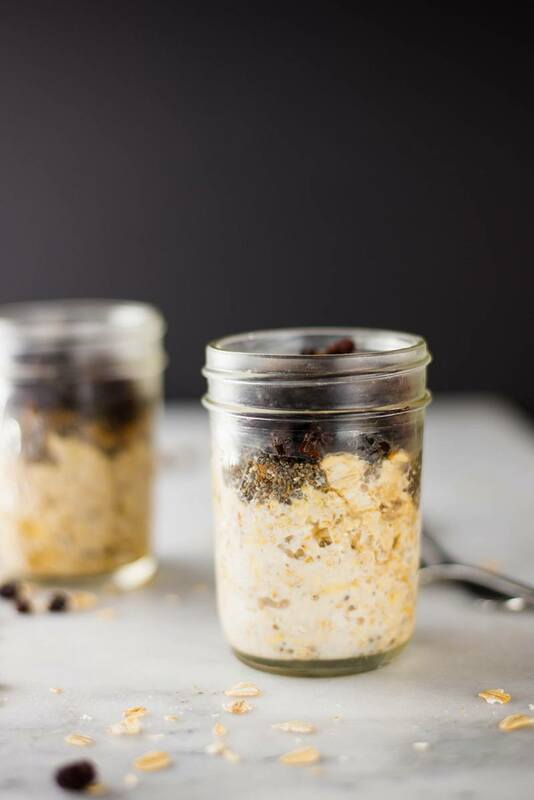 If you’ve been like me you totally missed the boat on overnight oats, please try this recipe and see just what you’ve been missing! It’s really so easy — just combine all the ingredients, pop in the fridge, and go to sleep. They’ll be waiting for you, all nice and tasty-like when you wake up. 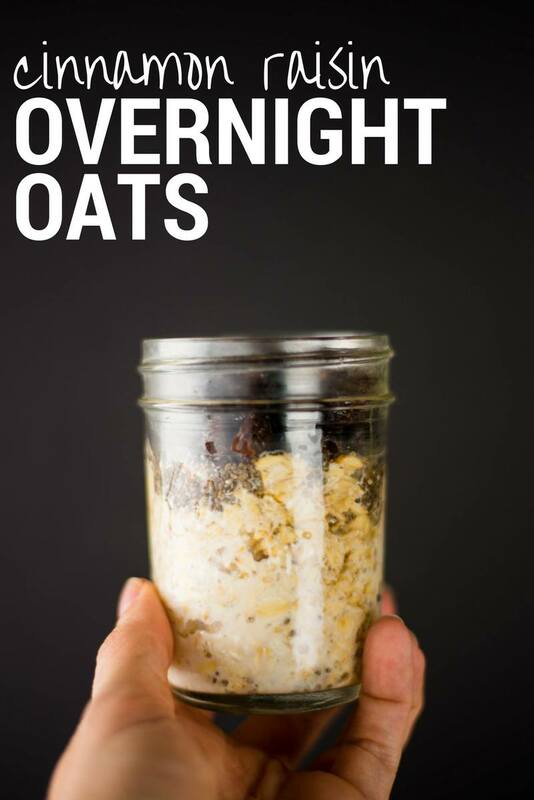 This overnight oats recipe is extremely easy to make. Just combine all the ingredients, pop in the fridge and go to sleep. They'll be waiting for you, all nice and tasty-like when you wake up. Place the jar into the fridge for 4-6 hours, preferably overnight. Can be either be enjoyed cold right out of the fridge or reheated in microwave for 1-2 minutes. This post was last updated on October 14, 2016 to include new images and an updated recipe. 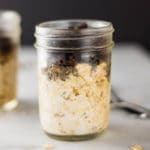 I have a couple questions, I’ve never made overnight oats before,can this recipe or any other overnight oats be made in the afternoon or do they need to be made in the evening, to be eaten the next morning? also with this recipe do you have to use pure vanilla extract? I only have imagination. Also how long can overnight oats last in the fridge? Can I make this without adding chia seeds? Can this be made with steel cut oats instead of rolled oats? I made the overnight oats last night and just enjoyed them for breakfast. They have the perfect amount of sweetness and the texture was good. I like it cold and I love that it was ready when I woke up 🙂 thanks for sharing it . Yay!!!! I totally agree with you on the sweetness level and texture AND on liking them cold 🙂 Glad you enjoyed them, Robyn! 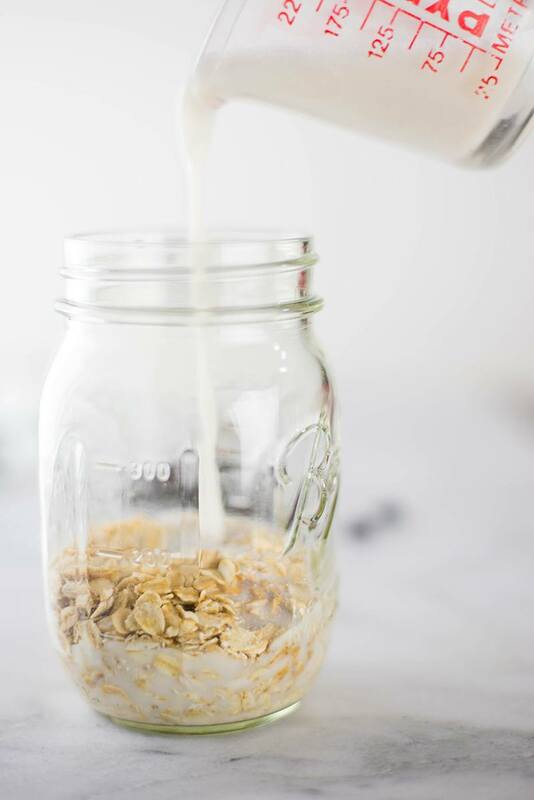 Hi Lacey, I like the idea of these overnight oats. 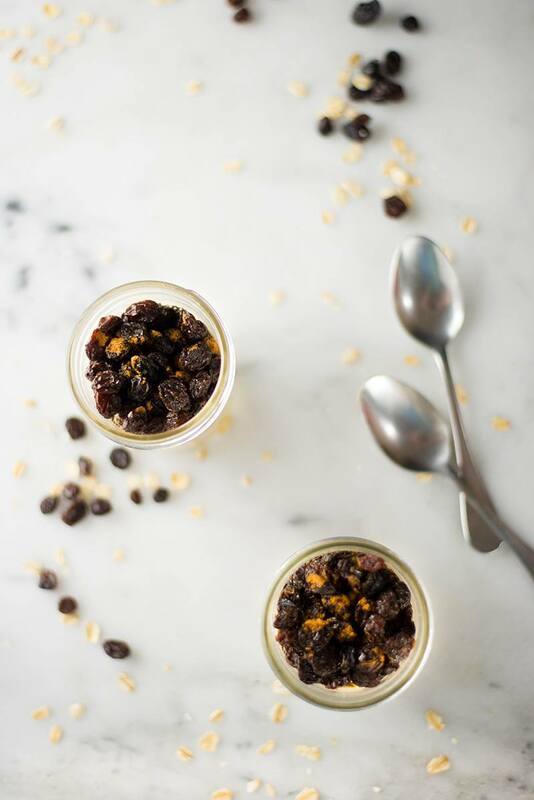 Two questions … you mention honey (“it’s hard to go wrong with cinnamon, honey, oatmeal, raisins, and yogurt”) but no honey listed in recipe list of ingredients. Should I add honey? How much and before or after letting sit for 5 hours? Also, do you eat it cold or zap in microwave before eating? Always think of oatmeal as being eaten warm but this one is served cold, correct? Thank you. Do you heat them up before eating? of course not. they’re delish straight from the fridge! Donna, very good question! I personally like them cold but you can certainly heat them up in the microwave for a couple minutes to enjoy as well. I’ll put that in the directions as well – thanks for asking!